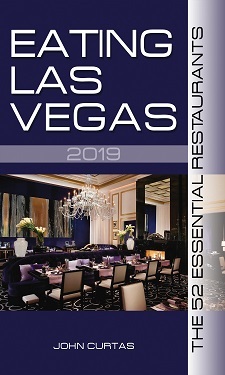 ELV note: This review appears in today’s Las Vegas Weekly. Click here to read it in its original format, or continue below, to enjoy the prolific, profound prose, for which ELV is known, plus Beverly Poppe’s propitious pics. Tired of the same old Korean food? Bored with bibimbap (rice and vegetables in a stone pot)? Jaundiced about jjigae (soup with vegetables)? Had it with haejangguk (meat soup with veggies)? Then consider heading to South Rainbow Boulevard at Robindale, where Soyo Barstaurant will set you up with some good ol’ chicken wings, Korean-style. Their version is thickly coated with a spicy-but-not-heavy, flame-red barbecue sauce, and it’s moist beyond belief. From those wings to the crispy whole fried chicken to the mandu (dumplings)—filled with pork and glass noodles and delicate in a way most thick, doughy mandu don’t approach—this kitchen tweaks a cuisine mired in meat, soups and stews to show its lighter, more modern side. Right off the bat it’s clear: This is not your standard, clichéd Korean. Everything coming out of Soyo’s kitchen seems to be tweaked to make the food match the groovy, retro Asian feel that owner David Sim has imbued this small space with. Six bench tables sit next to a raised wall of small booths—all done in a spare, monochromatic style. The laid-back look has been an immediate hit with the hipster-Asian crowds, who also seem to groove on a (sometimes too loud) music mix ranging from Lady Gaga to the ooh-baby-baby-Barry White vernacular. If you had to equate Soyo with another place in town, Ichiza would be its closest cousin. Both are youthful drinking establishments with lots of wacky Asian food and a keen, edible, izakaya vibe. Very spicy chicken with mozzarella-yes, mozzarella-from Soyo. Make no mistake, though. Soyo can go old-school on you in the blink of an eye. While those looking for a traditional Korean barbecue joint with standard issue kalbi and bulgogi will be disappointed, stir-fried beef intestines with blood sausage might be just the sort of thing to get some old Korean chap through a cold winter’s night along the 38th Parallel. The bowels’ furry insides and the incessant gaminess of the black cylinders will stay with you long after you would like to forget such things. Better to stick with the “new” or “tapas” portions of the menu, where such toothsome treats as a mound of spicy pork ribs or a tangle of thinly sliced/flash-fried “marbled beef” with green onions and a “special sauce” (tasting like a light ponzu) await. Equally arresting: beautifully grilled mackerel, or bai-top shells (a form of whelk/conch) tossed with vegetables and ribbons of thick rice noodles. Or the “very spicy chicken with mozzarella”—a compelling assemblage of dark and white chicken chunks, coated slightly with an incendiary chile sauce and draped with a nice, white blanket of cheese. The cheese gives it that gooey, gummy texture Koreans seem to love, and the red chile sauce provides a deep, soothing warmth, rather than giving an electric shock to the body like Thai or Indian chilies. The trendy, modern Korean Soyo Barstaurant on Rainbow Blvd. Less exciting offerings include standard issue ban chan (the side dishes that come with every Korean meal), as well as the fish eggs and kimchi fried rice—one, basically a bowl of steamed rice with roe scattered atop it, the other with a fried egg plopped on top. The thick, gooey potato pancakes are another acquired taste, but they’re full of potato-ness and taste like they were made seconds before hitting your table. To drink? The place is full of good suds and sake, but the mak gu li—a farmer’s rice wine of spritzy/sweet goodness and relatively low alcohol—is what you’ll want to try. Maybe it’s the slight spritz or the milky, grainy goodness, but I can’t imagine drinking anything else with Korean food from now on. It is remarkably easy to chug and goes better with this food than any soju or sake. It’s also great to quell the heat from some of the soul-warming dishes here. One thing you won’t want to quell, though, is the cozy feeling this place gives you. Monday-Thursday, 11:30 a.m.-3 a.m.; Friday & Saturday, 11:30 a.m.- 4 a.m.; Sunday, 11:30 a.m.-2 a.m.